One of the healthiest greens around plus one seriously antioxidant-packed veggie – what could go wrong? Well, actually, a lot. We’re the first ones to admit we naturally gravitate towards the delicious array of dips at a party’s appetizer table, and spinach artichoke dip holds a special place in our hearts. But more often than not, our hearts are broken when we venture over to get a taste, only to see our beloved produce picks doused in processed cream and gooey cheese. And if it’s a store-bought version, possibly a dose of chemical-laden preservatives in each scoop too. one bite might be harmless, but who ever has just one? Determined to find a makeover for this summer calorie bomb, we turned to L.A.’s most thoughtful hotspot, Cafe Gratitude, for a healthy solution to our dip dilemma. This mindful eatery is notorious for turning otherwise less-than-virtuous dishes into Chalkboard-friendly faves, and this warm spinach artichoke dip is a perfect example of what they do best. Combine the raw cashews, almond milk, lemon juice, garlic cloves, salt, yellow mustard seeds, and black pepper. Blend together in a Vitamix (if available). Transfer the cream to a food processor and add the baby artichoke and spinach. Pulse together until the mix is combined but still chunky and textured. Refrigerate until ready to bake, or transfer mixture to eight-ounce ramekins (it will yield approximately 4 to 5). Bake at 425 degrees for 17 to 20 minutes. Courtesy of Dreux Ellis, Cafe Gratitude. 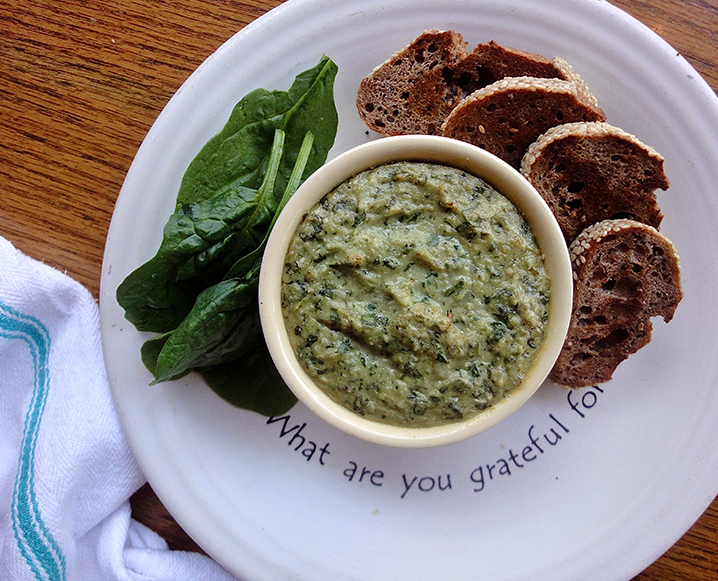 Share the post "Dip It Good: Cafe Gratitude’s Warm Spinach Artichoke Make-Under"
Love this! Please make it weekly to publish CG recipes for this of us who do not live near so cal!! I have been waiting all my life for this particular makeover ! I can’t wait to try it out, and yes, I am giving myself permission to gorge myself silly. The wait is over – enjoy!